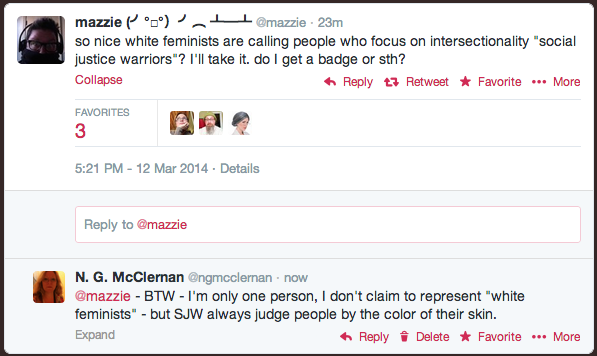 SJW have decided that white feminists will be the sacrificial lamb on the altar of "intersectionality." And unless you have joined the SJW movement you are in the demonized and smeared white feminist flock. As I found out, and as targets of SJW Flavia Dzodan and SJW Sarah Kendzior found out. The worst aspect of SJWs is that they took a good cause - social justice - and using social media turned it into an excuse for bigotry, mobbing and all-around stupidity. And people like mazzie and her mean girl gang Alison Bellach Sonderegger (@alibee), @alittlelately and Amanda Levitt (@FatBodyPolitics) are all very pleased with themselves in their vicious and hateful cause. 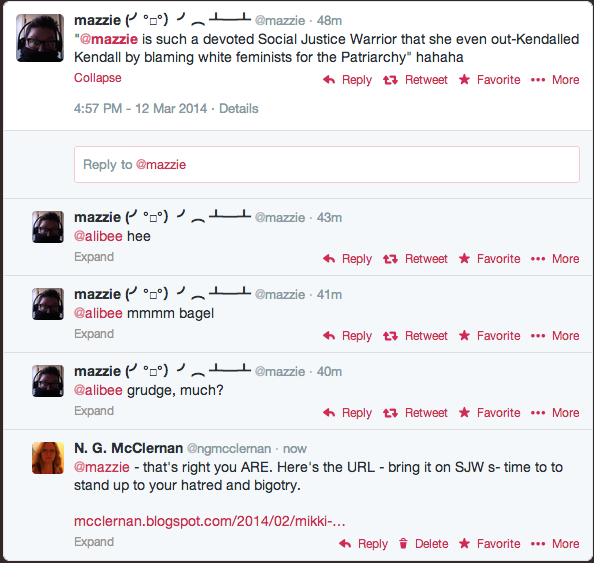 Demonizing and smearing people - especially white feminists - gives their lives meaning. NEXT DAY UPDATE: Of course I haven't heard back directly from mazzie herself in response to this post, although I suspect she's whining about it to her SJW pals on Twitter. But she's also spent at least 30 50 minutes today (3/13/2014) checking out this web site from her office computer. As mazzie herself would say, "grudge much"? SJW are always of the opinion that if they attack people, especially white feminists, those people need to get over it and move on. This "moving on" never applies to SJWs though. They get a different set of rules. Now I am totally in favor of the US government collecting taxes in order to fund worthy health-related agencies. But I'm not too happy about the office equipment of We the People being used by mazzie to prosecute her war against white feminists. Get back to work, mazzie.